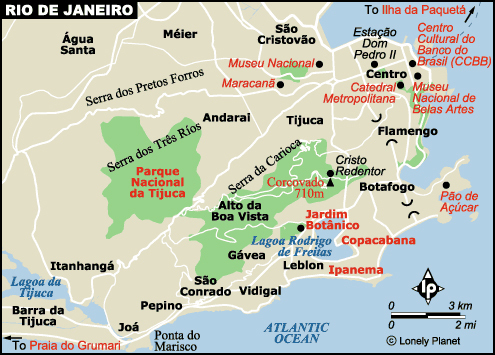 With the inauguration of Brasília in 1960, Rio de Janeiro ceased to be Brazil's capital. However, even today, this second largest city in Brazil is still a major cultural capital and, to some extent, its "emotional" capital as well. Rio de Janeiro has a majestic beauty, with built-up areas nestled between a magnificent hay and dazzling beaches on one side and an abruptly rising mountain range, covered by a luxuriant tropical forest, on the other. This unique landscape makes Rio one of the most beautiful cities in the world, justifying its title of "Marvelous City" ("Cidade Maravilhosa"). Rio's cultural life is intense and varied. The Panoramic view from this unique 887-feet-high belvedere is unrivalled, and is the only site from which one can view the whole of Copacabana beach. The best time of day to visit Sugar Loaf is late afternoon or early evening, so tours will usually end here. The summit is reached by a two-stage cable car. Located atop the Corcovado Mountain at a height of 710m (2330ft), the statue the Christ the Redeemer is certainly one of the world's best-known and most-visited monuments. The Statue at the very top of the mountain, faced with a soapstone mosaic in the finest art nouveau style, is reached via a flight of steep steps. The view from this vantage point, with the surrounding Tijuca National Park spreading below and a circle of mountains marking the horizon at the very back of Guanabara Bay, is nothing short of breathtaking. Open daily, from 9am to 6pm. The city of Rio is, literally, sliced down the middle by an impressive mountain range, which makes it possible to go to the beach in the morning and then enjoy the cool of the rainforest and the refreshment of natural pools and waterfalls in the afternoon. Tijuca forest is filled with attractions, from the obvious Statue of Christ to the pagoda-style belvedere at Vista Chinesa and the giant granite picnic table at the Mesa do Imperador. In 1808 the Prince Regent D. Joao of Portugal, created these impressive tropical gardens as a temporary repository for imported plants, where they could become acclimatized to the tropics. Since being opened to public visitation by his son D. Pedro I in 1821, the Gardens have never lost their appeal to residents and visitors alike. The Botanical Gardens are home to some 2,600 species of plant life, a myriad of riches for plant lovers. Bromeliads and orchids are prominently featured in their own exhibits. In addition to the varied plants, a wealth of wild life can be observed in the Gardens: among the birds to be seen are Toucans and Tanagers, while the Marmosets seem to be permanently leaping from one fruit-bearing tree to another. Open Tuesdays to Sundays, from 8am to 5pm. Lagoa is an odd neighborhood, as the focus is the big lagoon (Lagoa Rodrigo de Freitas) that drains into the ocean between Ipanema and Leblon. For the majority of Cariocas, this is primarily a recreation area. They come to walk, cycle, inline skate, or run the 5 1/4-mile (8.5km) pathway that circles the lagoon. In the afternoon and evening, the neighborhood's pleasures become more hedonistic as people come to the many waterside kiosks to grab a drink, have some food, or listen to a group play live music. This stadium is Brazil's temple of soccer. It's a giant among coliseums, easily accommodating more than 80,000 at a time. If sports interest you even the littlest bit, or if you just want a new insight into Brazil, then by all means check out a football (soccer) game - preferably a championship game or one between local rivals Flamengo, Vasco, Fluminense or Botafogo. It can be an intense, quasi-psychedelic experience. The sports museum inside the stadium has photos, posters, cups and uniforms of the greats. Maddening traffic, unbearable noise, packed apartment blocks, and one of the world's most famous beaches - this is Copacabana, a Manhattan with bikinis. You can swim here, although pollution levels and a strong undertow can sometimes be discouraging. Two blocks from the beach and running parallel to it is Avenida Nossa Senhora de Copacabana, the neighborhood's main commercial street, whose sidewalks are always crowded with the colorful characters that give Copacabana its special flavor. As you stroll along this beach, you'll catch a cross section of the city's residents. There's an area dominated by families, a spot near Copacabana that tantalizes surfers, and even a strand favored by the gay community. For a close-up look at the posh apartment buildings, stroll down beachfront Avenida Vieira Souto, or drive around the lagoon on Avenida Epitácio Pessoa. Also check out Praça Nossa Senhora da Paz, which is lined with wonderful restaurants and bars. Leblon is centrally located, has excellent nightlife possibilities, first-rate shopping areas, restaurants, and all conveniences in a walking distance. Upper Leblon is a hilly residential area with mansions, and spacious apartments. The street along the beach is Av. Delfim Moreira. Tijuca. Barra is a sort of a self-contained city. The beach is gorgeous, unpolluted, and over 10 miles long - a surfer's dreams come true. This is the land of malls, including the largest one in Latin America - Barrashopping. There are huge hypermarkets, condos, theme parks... any similarities to Florida are not coincidental. RioCentro, Rio's Convention Center, is 15 minutes off-Barra in Jacarepaguá.